This week my wife and I had a follow-up visit with our naturopath Dr. Timothy Hyatt to discuss the results of her tests and get a plan in place. (Read part 1 of our naturopath experience here.) It turns out my wife's thyroid is a little sluggish, which could be the cause of some of the fatigue she's been having, but she's not in the range of people who need to take thyroid hormone. It's always best to take the minimum effective dose just to mitigate any risks, side effects, or general issues you can have with a drug, so this is good news! 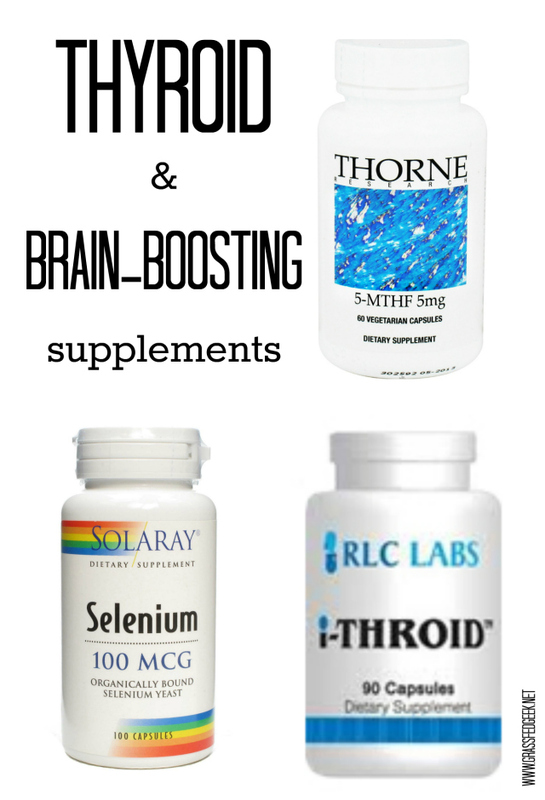 Basically we're both going to start taking a couple of supplements that are directly involved with thyroid function, and one that is good for overall brain health, and see if things improve. I talked about this the last time, but I've got some more specifics! We're going to try a supplement called i-Throid which is specifically formulated with multiple forms of iodine that are more easily absorbed in the body, and don't tend to cause any issues. Although this appointment was for my wife, I'm going to start taking these too because I'm sure I'm not getting enough iodine in my diet. Even the amount that they add to table salt isn't enough to have a major effect if you're deficient, which most people are. When you're taking this amount of iodine you also need to supplement with selenium. It's a heavy metal that also protects against thyroid problems, and Dr. Hyatt specifically wants us to take these together for the best thyroid-boosting results. Folate is another thing a lot of people are deficient in, and it's essential for optimum brain health. Getting it in a form called 5MTHF is important because it's the active form of folate which is highly bioavailable, meaning it's easily absorbed into the body. It's related to folic acid, but that is apparently not a good substitute. I'm not sure on the specifics there, but Dr. Hyatt was clear on why the active form would really be helpful. It's important to get as much of your nutrients from food as possible. That's what your body is designed to do! But there are things that are hard to get into your diet that can really help you perform at a higher level, and bolster your health over the long term. I saw a documentary once where some elephants would occaisonally dig out mud from the bottom of a specific pond and eat it because there were nutrients in it that they couldn't get anywhere else. Now, if elephants are supporting their healthy diet of leaves with muddy, mineral supplements, I think I can feel pretty good about taking my vitamin D, fish oil and iodine in order to boost me. It's not about having to take these things in order to survive, but it is about reaching your healthiest potential. Great post. Well written and informative. My biggest problem is I forget/ get too busy to take supplements. I have a variety that I take. But, they all can't be taken together and some have to be taken with food and others don't. Between remembering all that and a busy life I can't figure out the best way to get my supplements (or hell, eat) in a day. I'm working on it... but, that has definately been my biggest struggle. This is very interesting! I was diagnosed with Hashimoto's disease almost 20 years ago and have been on a thyroid medication since then. I wonder if I should add these supplements in? Yeah, he's been great! Adding some of these things to your diet will help so much in terms of long term health, it's an awesome investment. It's possible that adding iodine would help your thyroid overall, in addition to the medication. I'd ask a naturopath if possible, but it's not too risky to start supplementing with it. Thanks for commenting! Thanks for the comment! I definitely find that when I get busier things like eating well get a lot harder. For supplements I have a weekly pill organizer that I put together that also has am and pm because there are some that I take in the evening, others in the morning. That has really helped me keep it all organized. There are so many options out there that I'm completely overwhelmed ..